At Green Beans Coffee, we believe that community is cultivated over a cup of extraordinary coffee or tea, as it has been for generations all over the world. We honor our brave men/women in uniform by donating a percentage of our sales to organizations that support the families and children of the fallen. Our goal is to install a Fallen Heroes Battle Field Cross at the entrance of the café by Memorial Day 2019. 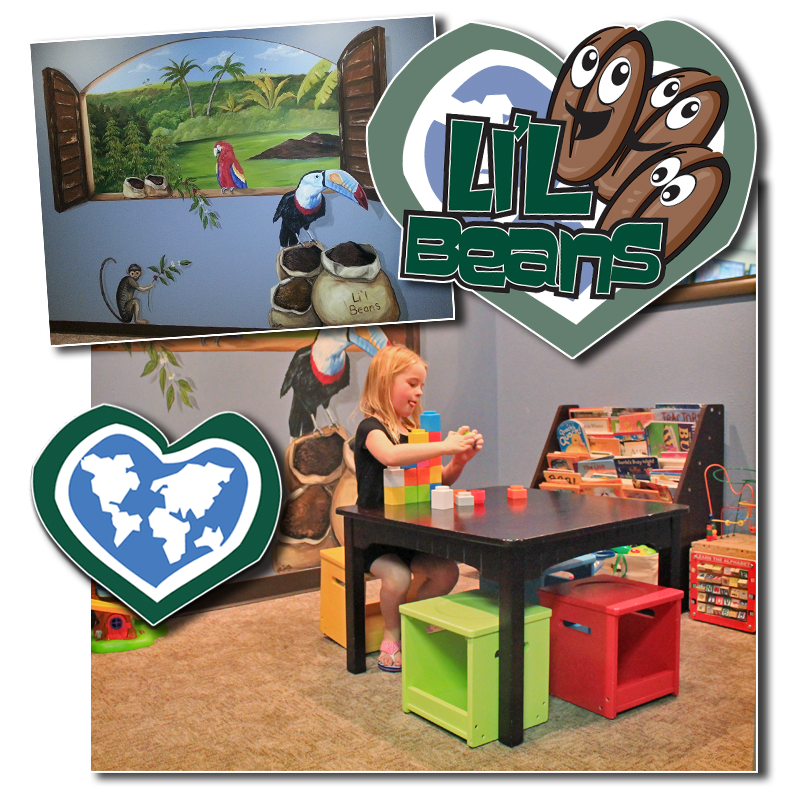 Guests of Green Beans Coffee Omaha wanted to help make this happen, so it has become a community driven effort. Installation and concrete being completed by volunteers. We really appreciate your support. Green Beans Coffee Company got its start by offering some of the comforts of home to the men and women of the U.S. Military, deployed at bases overseas and in areas of conflict. The Omaha location is the first independently-owned café to open in the U.S.
Born in Springfield, Illinois and raised in Grand Island, Nebraska, John Sievers entered the Air Force in June of 1988. He was introduced to Green Beans Coffee while deployed to Afghanistan in 2007. After 26 years of active duty service, John retired in July 2014. His love for country, his passion for leading small teams of people, and his love of coffee inspired the opening Green Beans Coffee Omaha on 12 October, 2014. His wife, Angela, is the co-owner. She grew up on the east coast of Canada and is an elementary school teacher by trade; however, is currently back to school working on a dual Masters program in counseling and psychology. John’s two older daughters, Kirstyn and Kelsey, are both great helpers around the cafe. John and Angela have a daughter, Johanna, who is the “manager” of L’il Beans. View the videos below for a better look at this fast-growing business. Click a button below for a popup video that showcase more detail of our company. We offer a plethora of hot and cold eats and treats. Whether you need a hearty breakfast or lunch, or muffins to go, Green Beans has your order. Hit the menu icon below for a taste. Eggs, Meat (Sausage, Bacon, or Chorizo), Crispy Hash Browns, Salsa, Refried Beans, and Pepper Jack in a Spinach Tortilla. Eggs, Sausage, Bacon, Crispy Hash Browns and Pepper Jack on a Fresh Croissant. Brown Sugar, Dried Fruit & Nuts. With Seasonal Fruit & Granola. Our Classic Open-faced Hot Sandwich – Turkey & Bacon, Chicken Pesto, Ham, Roast Beef, Buffalo Chicken, and Breakfast. Served on our Special, Fresh-Baked Levitato Bread. Hot or cold, caffeinated or not, Green Beans’ specialized drink menu has you covered. From Espressos to Smoothies and so much more. Hit the menu icon below for a look. We serve our customer’s coffee made from the highest quality Arabica coffee beans, freshly roasted in the artisan European style. Our six proprietary blends are packaged for sale on our website, at retail stores, and in many of our cafés. Green Beans Coffee Company hand crafts over 20,000 cups of coffee daily in company-owned and operated cafés, in 10 countries on 4 continents. For two decades, from San Francisco to Baghdad, we’ve been privileged to answer the call to serve in communities, neighborhoods, airports, bustling cities, and even active conflict zones, where no one else will. Green Beans Coffee Omaha is the first independently owned / free standing Green Beans coffee café in the country. In addition to espresso-based drinks, Green Beans Coffee Company serves teas, smoothies, fresh-baked pastries, freshly prepared breakfast items, and a wide assortment of wraps, sandwiches, and soups for lunch or dinner. We take pride in offering the simple luxury of 15 minutes of home to everyone. Corporate social responsibility is a key pillar of our company, and we believe in giving back to our customers that serve in the U.S. military. Thus, we donate a portion of each transaction to organizations that are important to our men and women in uniform. 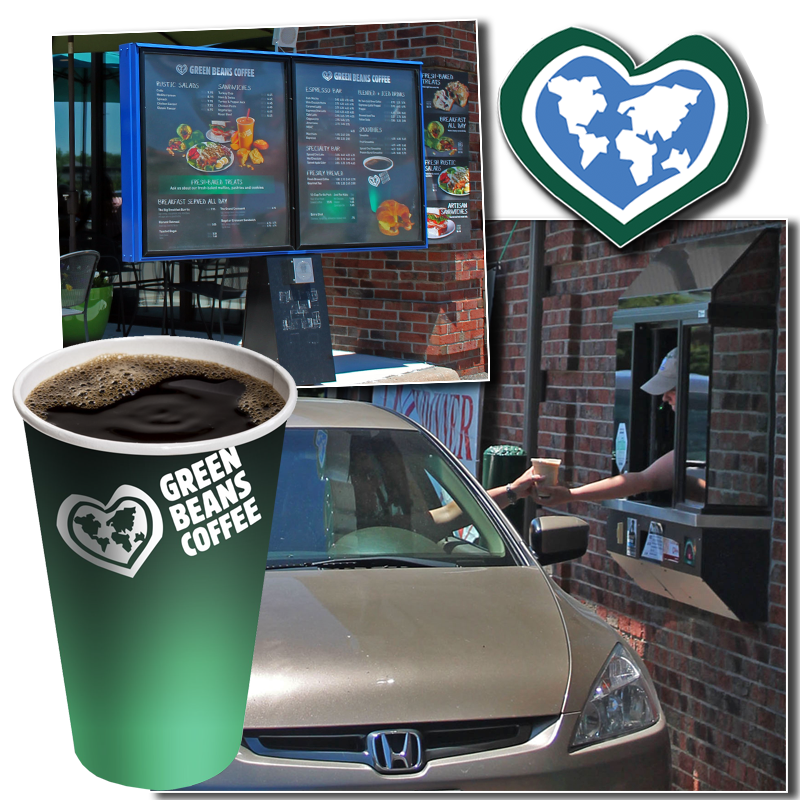 Through our Cup Of Joe For A Joe program, we make it easy for anyone, anywhere in the world, to buy a fresh cup of Green Beans Coffee and have it delivered with a personal letter of thanks to a member of the armed services deployed overseas. To date, more than 2,000,000 Cup of Joe’s have been purchased for our deployed troops. We also facilitate connections on our Facebook page between troops deployed overseas and their friends, family and other supporters who want to express their thanks for the troops’ service and sacrifice. We serve our customer’s coffee made from the highest quality Arabica coffee beans, freshly roasted in the artisan European style. Our eight proprietary blends are packaged for sale on our website, at retail stores, and in many of our cafés. 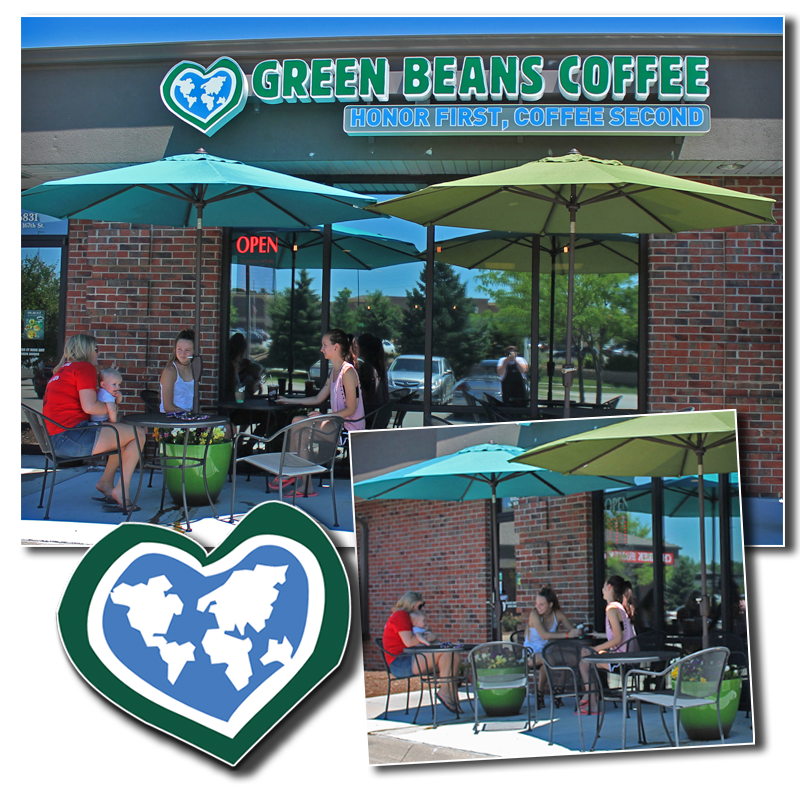 Green Beans Coffee Company owns and operates 70+ cafes, in nine countries. All are located on or near military bases in the U.S., Iraq, Afghanistan, Kuwait, Qatar, Djibouti, and Kyrgyzstan. Green Beans Coffee Omaha is the first independently owned / free standing Green Beans coffee café in the country. In addition to espresso-based drinks, Green Beans Coffee Company serves teas, smoothies, fresh-baked pastries, freshly prepared breakfast items, and a wide assortment of wraps, sandwiches, and soups for lunch or dinner. At Green Beans Coffee, twenty-thousand cups of coffee are served daily. Through our Cup Of Joe For A Joe program, we make it easy for anyone, anywhere in the world, to buy a fresh cup of Green Beans Coffee and have it delivered with a personal letter of thanks to a member of the armed services deployed overseas in support of Operation Enduring Freedom (OEF). To date, more than 900,000 Cup of Joes have been purchased for our deployed troops. We also facilitate connections on our Facebook page between troops deployed overseas and their friends, family and other supporters who want to express their thanks for the troops’ service and sacrifice. At the Omaha location, you will find a clean and elegant atmosphere, both inside and out. Inside, we offer a comfortable lounge area with inviting fireplace for those cold winter days. We have multiple-table seating for group gatherings or meetings. Green Beans Coffee Omaha offers free WiFi available throughout the property for your online needs. Customers are invited to relax with a daily newspaper or to watch television screens, placed throughout the café. Customers are also welcome to enjoy our outdoor patio seating. We are proud to offer an enclosed area for children, complete with books, toys, and a television. The room is surrounded by bar seating for parents to watch their loved ones. This area gives children the chance to entertain themselves while the adults enjoy their beverage or lunch. Green Beans Coffee Omaha is a family-friendly establishment, and all are welcome! Since 2006, the mission of Snowball Express has been a simple, yet profoundly important one: to provide hope and new happy memories to the children of military fallen heroes who have died while on active duty since 9/11. We bring children together from all over the world for a four-day experience filled with fun activities, like sporting events, dances, amusement parks and more. Participating in Snowball Express makes every child feel special and giving them an opportunity to share their feelings about losing something as precious as a parent. America’s Children of Fallen Heroes, a Quietly Working Foundation, is a non-political, non-denominational, 501(c)3 non-profit organization (Federal Tax ID 20-5149597) focused on meeting the needs of the young men and women who have lost a parent serving in the United States Armed Forces, Fire Department & Law Enforcement. The driving motivation and ongoing commitment behind every effort is that we want each of these children to know that the citizens of the United States of America recognize their loss, and are committed to helping them achieve their highest potential in the course of their lives. “Remembering Our Fallen” was created in November 2010 by Bill and Evonne Williams of Omaha. Their eternal hope is to honor the memory of those who have made the ultimate sacrifice, to provide comfort to friends and family of the fallen, and to remind others of the tremendous cost paid by some. Its legacy will be that these men and women will never be forgotten and that their names will be remembered and spoken. ROF falls under Patriotic Productions, which is, as of 2015, a non-profit 501(c)(3) organization that was formed by Bill & Evonne Williams, who desire to honor the United States military and share that opportunity with others. “For One, For All” is committed to making a difference in the lives of First Responders, Veterans, and their Families. We aspire to be recognized as a leading provider of quality local and regional resilience programs by facilitating public and private resources. We will strive to bring awareness to issues that our emergency medical personnel, medical professionals, law enforcement officers, firefighters, veterans, and their families deal with daily. Our mission is to facilitate or offer services that will greatly enhance their emotional, physical, social, and family well-being. Fisher Houses have up to 21 suites, with private bedrooms and baths. Families share a common kitchen, laundry facilities, a warm dining room and an inviting living room. Since inception, the program has saved military and veterans’ families an estimated $407 million in out of pocket costs for lodging and transportation. before opening and 30 minutes after closing. and 30 minutes after closing.